The cicoria edible plant, gone to seed, produces these lovely purple flowers. I have not removed them yet as they are so dainty and sweet. The Ops Twins (see April 2013 “The Beet Goes On”story), goddesses of agriculture, united again to trim, weed and dismember parts of my garden in need of refreshing. This year my niece Maya joined in to help celebrate Mother’s Day and to lend a hand. 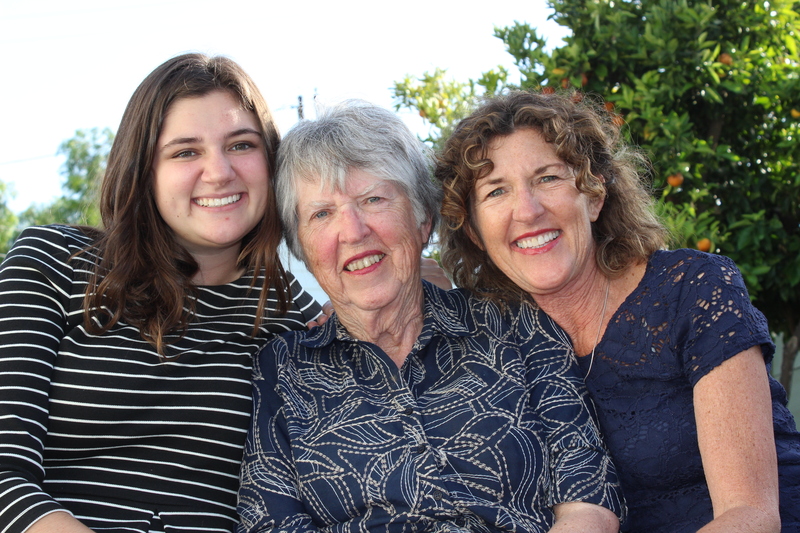 A trio of generations gathers to celebrate Mom and our friendships. I selfishly hang onto over-grown, gone to seed and wilting plants from my winter garden. I love the height and depth of colors the favas, kales and Italian greens grow into. They are a focal point in my yard, always happy with the cooler weather, requiring little attention except for the oohs and ah’s I deliver to them daily. Yes, I play favorites and my winter garden is my favorite child. 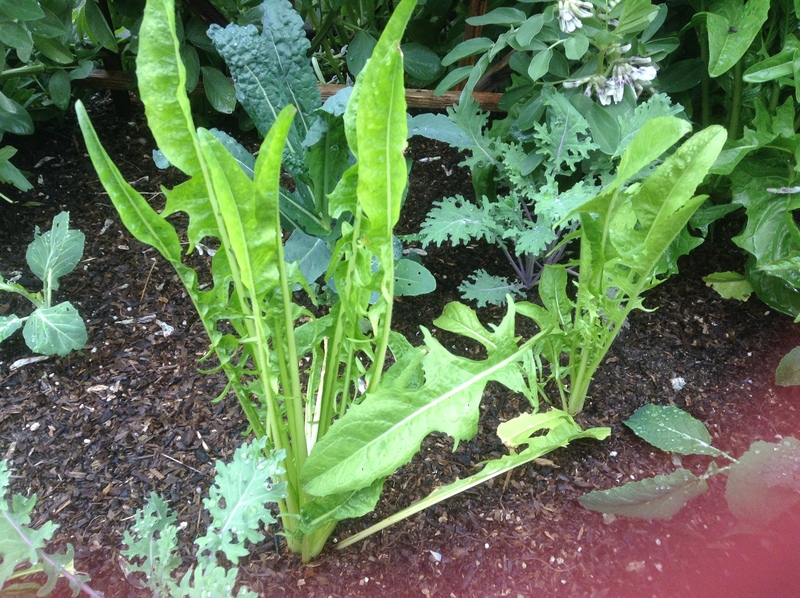 So, I procrastinate, as long as possible, adding these spent greens to my compost pile. 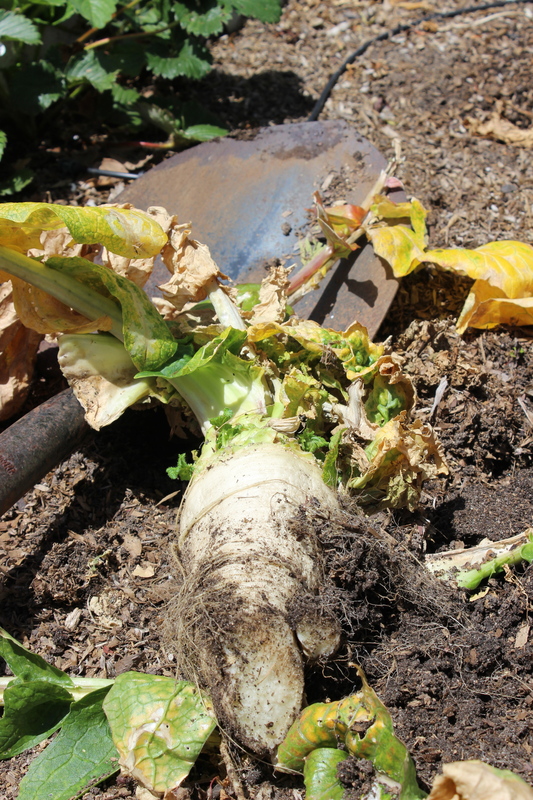 I dug up this giant Rapa Toscana root. 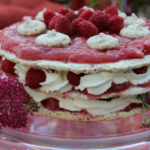 Does anyone know if you can eat this? Speak now or forever hold your peace! A farmer’s best friend. 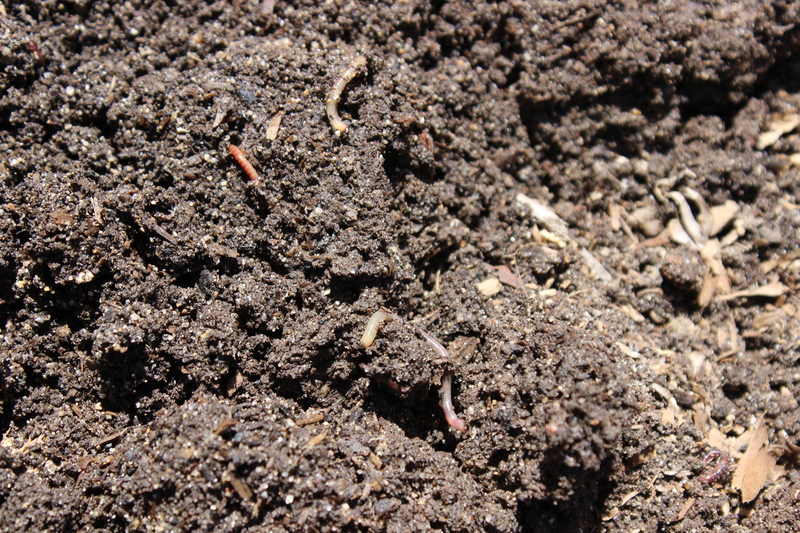 These worms will keep my soil healthy for the tomatoes. Something I did yesterday was to uproot the many volunteer tomatoes that have dug themselves into my gravel, and replant them with the other free spirits that sprouted up about two months ago in my strawberry box. It’s my experiment. All my tomatoes this year will be a surprise as to variety. Kind of like not knowing if it’s a boy or a girl. 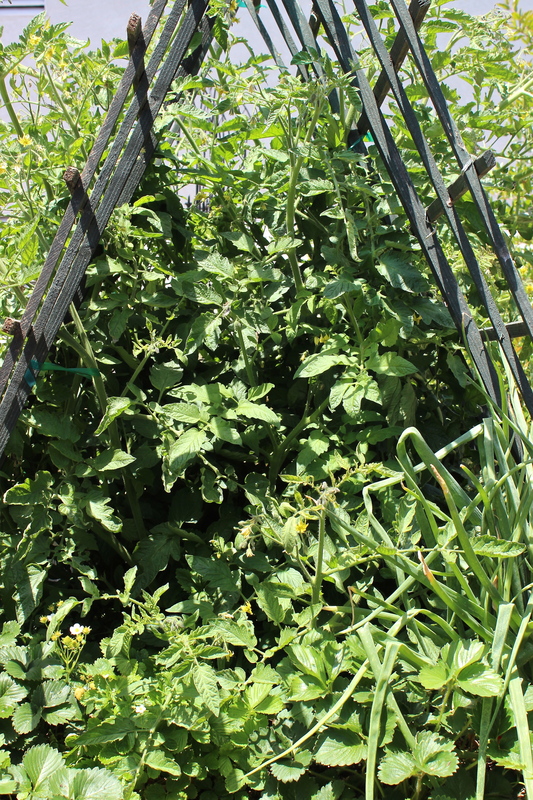 I fashioned a tepee of old trellises to stake up my volunteer tomatoes. I think it’s awesome! My box of flowering and consequently bitter greens is now vacant, awaiting another weekend inspiration. What to plant this spring? Most likely grilling veggies, as they seem to be my summer dinner – so simple and fresh. 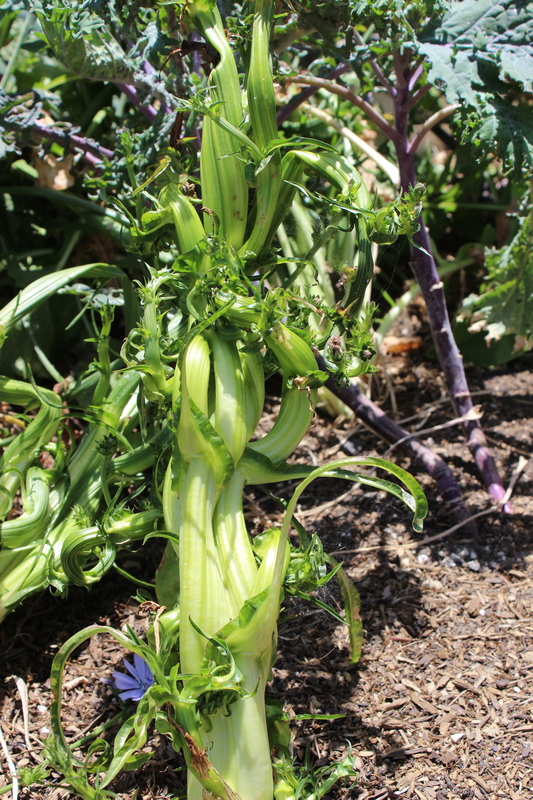 This Italian cicoria or chicory, is a sculptural work of art and my favorite plant this year. Its elegance dances a tangled tango. As I clear out and make space for new, I own this change and am re-energized at the prospect of vine-ripe tomatoes, long, skinny, deep purple Japanese eggplant, peppers of all colors, sweet and of fire, and who knows what else? 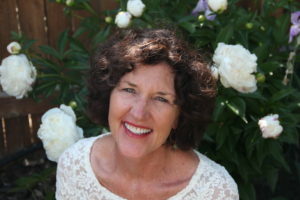 Feeling the warm dirt caress my fingers, as I dig holes for new seeds and plants, gives me a rush of joy and fills my happy heart with hope for abundance. What foods, ideas or dreams will you plant for yourself this week? 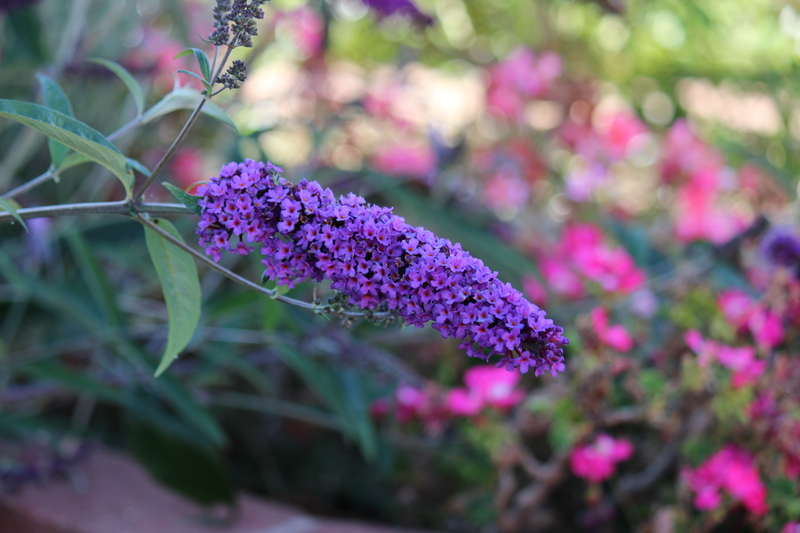 The Buddleia, or butterfly bush, is doing its job, attracting butterflies and hummingbirds galore. Since these guys are short season bloomers, I had to share their heartbeat. Leave room in your garden for the fairies to dance. Ciao for now! Happy planting! 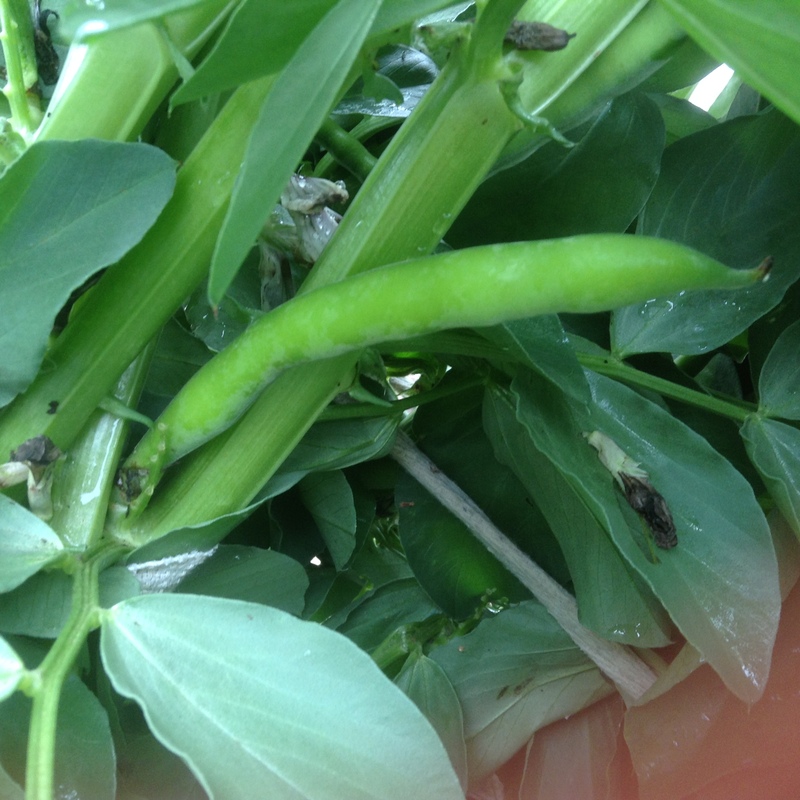 Flourishing favas before the squall that knocked them off their feet. 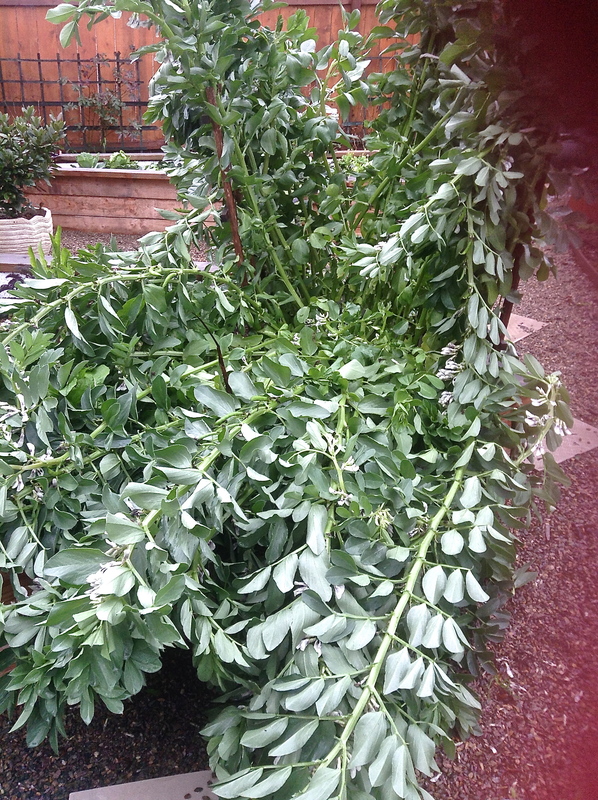 Last evening I returned home from a stormy (for San Diego standards) day to discover my precious fava beans completely toppled over from the heavy winds. My first reaction was “is there a trauma doctor in the house? 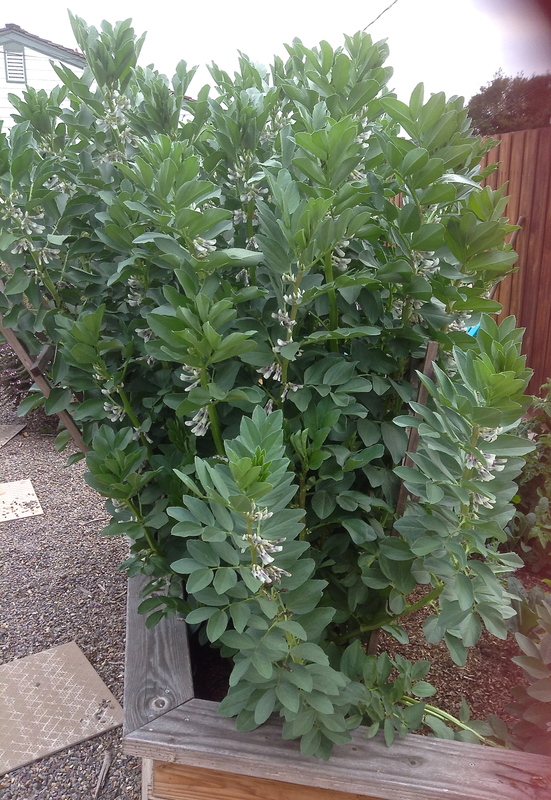 !” I have been babying these beans, planting them from seeds and watching them flourish far beyond my expectations. Tiny green fingerling beans are even starting to lengthen and grow from their sweet white flower petals. This little one is well on its way. I quickly decided not to give up on them. I would resuscitate them! Delving through my drawers to find something to tie them to the wooden braces already in the beds, I found an ace bandage. Stretchy and soft, I cut it into quarters lengthwise then cut 15 inch pieces. In the rain with darkness closing in, I carefully gathered up sections of the tall stalks and attached them to the posts as gently as possible. By the time I finished, they were again standing tall, although many of their delicate stalks had snapped. 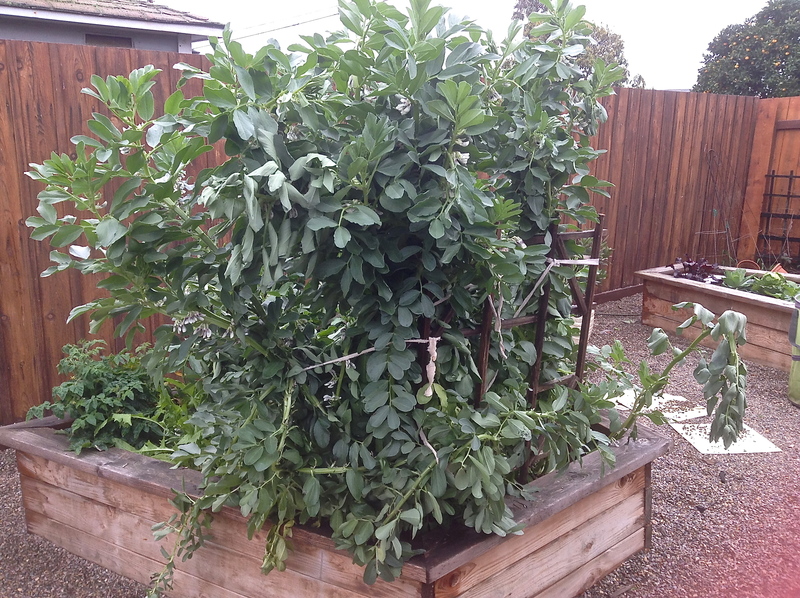 When the weather clears, I will add more posts and re-tie the favas to give them more breathing room but for now they are out of the ICU. Successful surgery. Patients are doing well. A kiss to make it better. My Italian garden will survive. The good news is that my chicory, Cimi di Rapa, a kind of Italian broccoli and Rapa Toscana are all healthy, thriving and getting ready for an Italian festa using all these veggies I planted from seeds I purchased in Italy. This is the greatest reward of gardening. Bringing a bit of ciao back home. 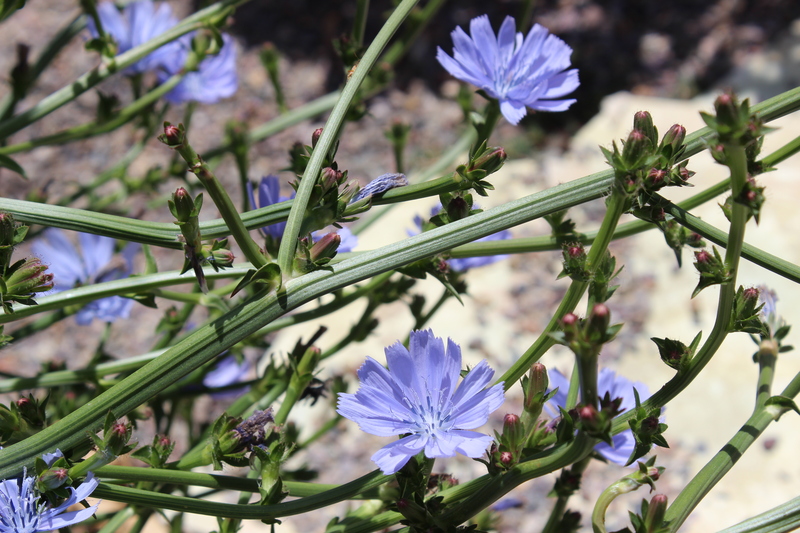 Chicory or Cicoria whose celery/fennel stalks are a springtime staple in Italy. 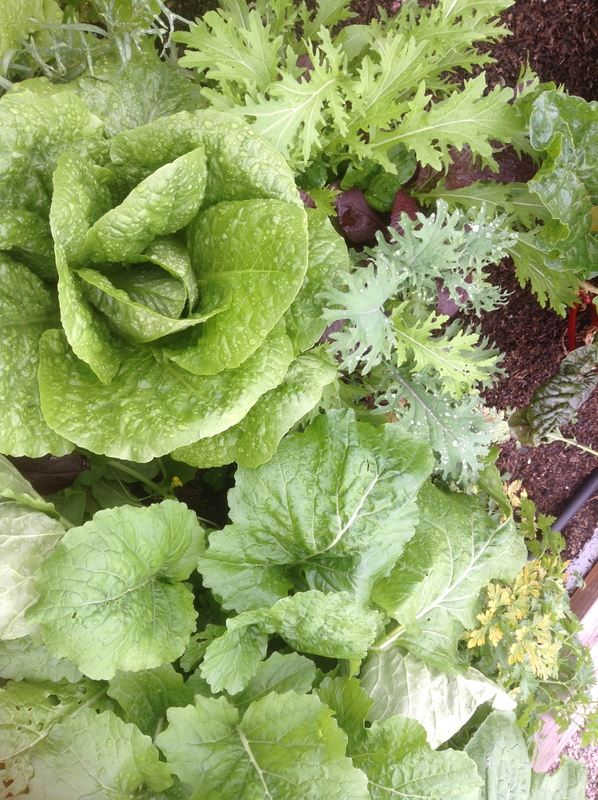 Cima di Rapa, bottom, romaine, left and kale on the right. A salad a day keeps the doctor away! 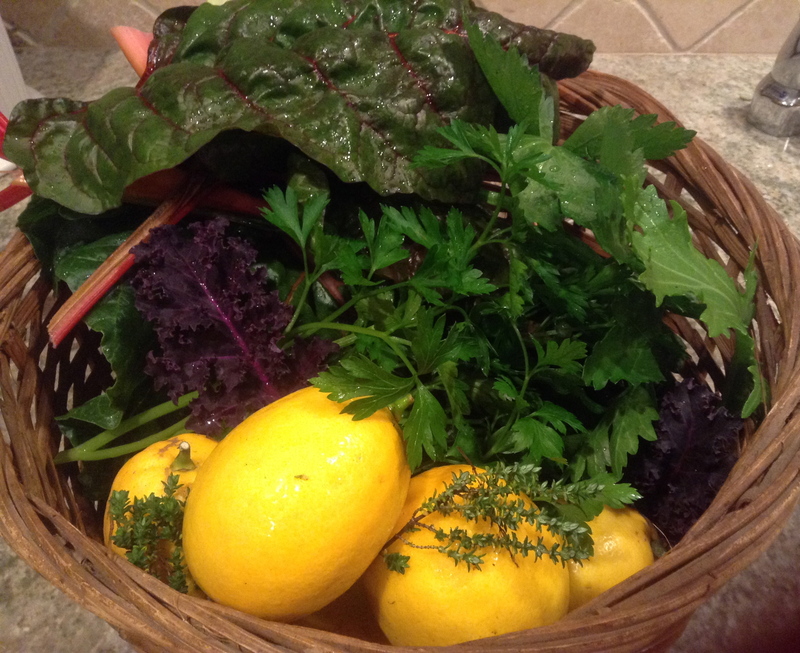 Garden freshness, just picked and ready for a dinner creation. That night I celebrated my successful surgery with a sauté of my garden goodness – swiss chard, two varieties of kale, parsley, thyme, shallots and shiitake mushrooms all spooned over some soft and creamy polenta I brought back from Lucca. The perfect meal for a rainy day. 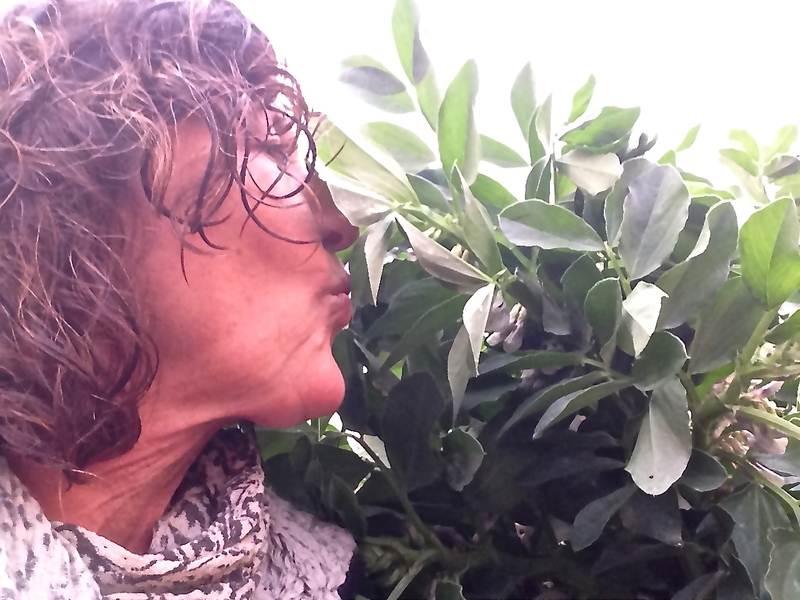 It soothed my soul and reminded me how good everything tastes when it is just out of the heart of the garden. 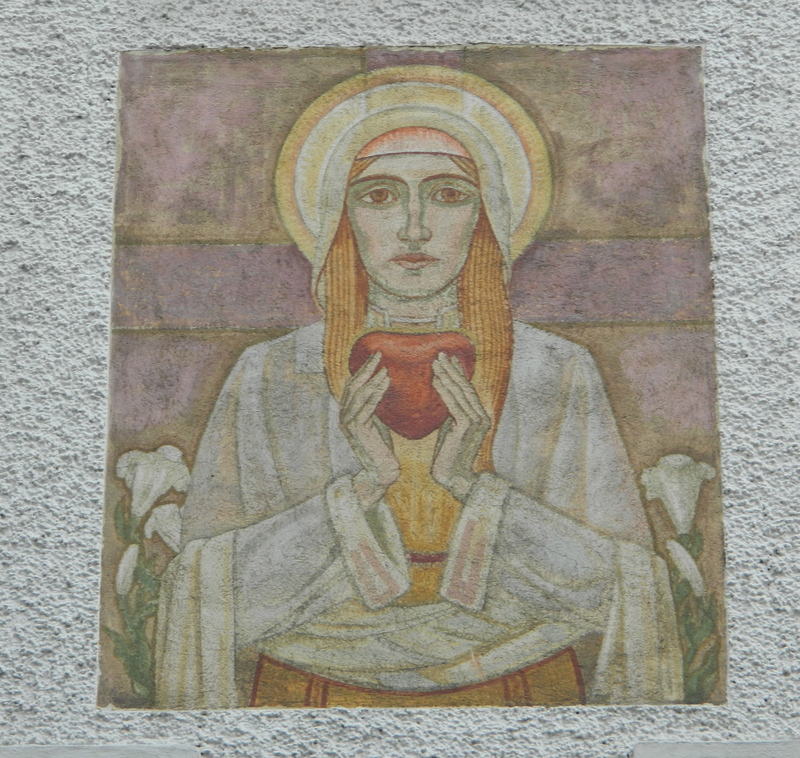 Heart to heart. Benissimo!